Most hikes into the Superstition Mountains east of Phoenix begin from the north side, accessed via the Apache Trail, and tend to be rather long and relatively little-used, but one of the shortest, easiest reached and therefore most popular routes starts in the south, at the edge of the expanding community of Gold Canyon along US 60. 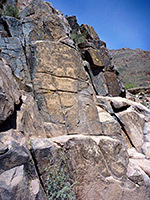 The 1.5 mile Hieroglyphic Trail climbs a gentle slope covered with many cacti then enters the lower end of a boulder-filled canyon, ending at a rocky section where pools persist for much of the year, a location important for the ancient Hohokam Indians, who inhabited this desert region up to 1,500 years ago. 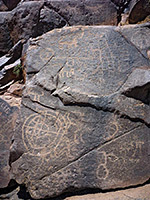 Evidence of their settlement includes hundreds of petroglyphs etched into the dark, weathered surface of the basalt cliffs above the pools, some with very intricate designs. This scenic location is high enough for a long-distance panorama southwest over Gold Canyon and the Gila River plain, and also provides close-up views of the jagged upper slopes of the Superstition Mountains to the north, rising over 2,000 feet higher. One other path in this area is the Lost Goldmine Trail, which meanders eastwards across the foothills to Peralta Road, a major gateway for long-distance hikes into the mountains. Both routes begin from a large parking lot at the east end of Cloudview Avenue, reached by a rather convoluted drive through the northern suburbs of Gold Canyon, turning left or right at about half a dozen junctions which fortunately are all signposted. This part of town is a tranquil residential district containing many large houses decorated with flourishing cacti including a selection of non-native varieties. Undeveloped lots still have all the usual Sonoran Desert cacti including saguaro, opuntia, cholla, ferocactus and echinocereus, plus at least two introduced species seemingly growing wild - opuntia microdasys and opuntia engelmannii var linguiformis ('cows tongue cactus'). A single path climbs the gently sloping hillside on the north side of the parking lot, up to a junction in front of a big cluster of teddy bear cholla, where the Lost Goldmine Trail forks eastwards and the Hieroglyphic Trail heads north. 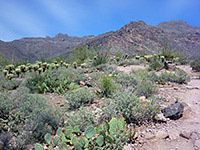 This route soon passes a gate and a fence marking the edge of the Superstition Wilderness, then for the next half mile or so follows an inclined ridgetop, before dropping down into a shallow wash at the mouth of Hieroglyphic Canyon, as the surroundings become more rocky, with loose stones underfoot. The trail ends beneath a small cliff overlooking smooth volcanic rocks around the streambed, which holds residual pools well into summer, though these become murky and filled with green algae if not refreshed by new rainfall. Much steeper slopes above are dotted with many barrel cacti and a few saguaro. 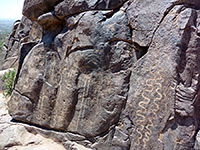 The petroglyphs are found mostly on the far side of the streamway, carved into the smooth, dark grey/brown surface of the enclosing rocks. They are all somewhat faded after being exposed to centuries of harsh desert weather but still quite impressive. 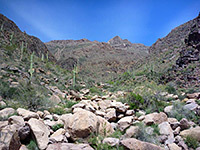 The canyon gains height more sharply upstream, beyond the end of the official path, and becomes rather overgrown though the drainage can be followed if desired, all the way to the Superstition Mountain ridgeline at about 4,600 feet.